yuken teruya is an artist based in new york. he loves manipulating everyday objects which are then later exploited through traditional craft techniques ; creating detailed and intricate artworks. i might even categorized his works into sustainability as the fact that his works always explore issues of the growing consumerism in the society today - placing his concerns and responses with current threat in globalism. 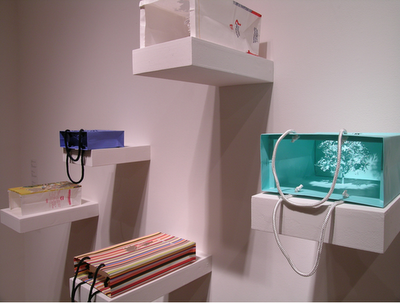 yuken teruya has several sculpture series (using different medias) throughout his projects. they are all very remarkable. nevertheless the following series which i would love to share include his utilization of paper bags, toilet rolls and books - cutting tiny detailed trees out from these materials with his delicate hand. 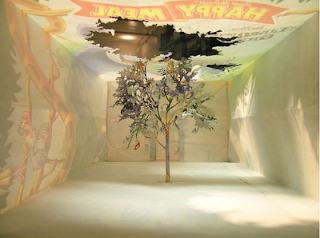 in this series, yuken teruya create his small enchanting world inside disposable paper bags. elaborate shapes of tree branches were cut and created without adding anything at all. he just folded and then placed each cut-out parts in the bags. 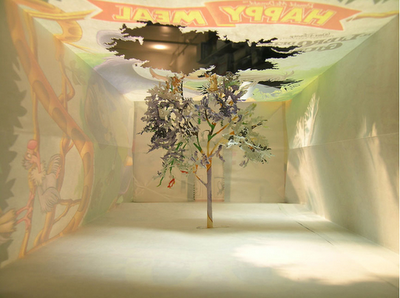 in each bag, portrait of a tree was assembled inside. For his rain forest and corner forest projects, yuken teruya transformed toilet paper rolls into another beautiful artworks. he carefully cut tree branches; creating remarkable positive and negative images. how magnificent is the cut-out tree silhouettes that support themselves by just using their own weight. these amazing craftsmanship - giving a new life to the lifeless. looking as fragile as it might be; instead - it shows us the existence and remind us the strength of a tree. I didn't know anything about this artist, but I think I'm in love with his work now!